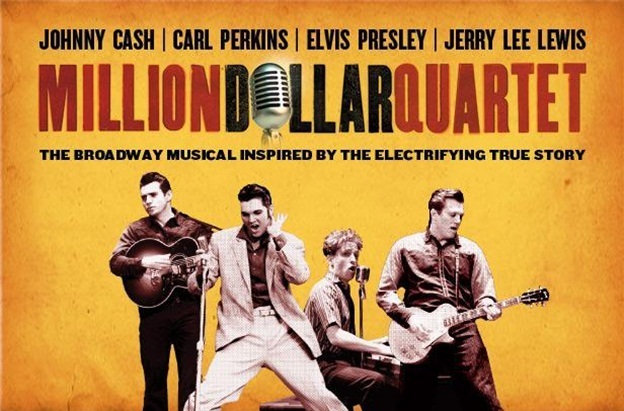 The award-winning Broadway musical Million Dollar Quartet is a unique Branson show that allows you to hear the music of Carl Perkins, Elvis Presley, Jonny Cash, and Jerry Lee Lewis, all in one stage. This brand-new Branson show is critically acclaimed as a world-famous production that brings audiences on a journey with some of the biggest performers in Rock ‘n Roll. For a unique and fascinating musical experience that is different from many of the shows you may have seen in Branson, Million Dollar Quartet is something you won’t want to miss. As the host of one of the most famous recording sessions of all time, the legendary “Father of Rock ‘n Roll” Sam Phillips will bring some of music’s most iconic and legendary singers together for a night that would go down in the history books. On this significant night, Sam Phillips will bring Johnny Cash, Carl Perkins, Jerry Lee Lewis, and Elvis Presley together in Branson. Throughout the musical show you will hear some of the biggest hits of all time including “Fever,” “Whole Lotta’ Shaking’ Goin’ On,” “Who Do You Love,” “Blue Suede Shoes,” “Ghost Riders,” “Sixteen Tons,” and “Great Balls of Fire.” This Branson show is one of the most amazing production shows to be found in the country. Million Dollar Quartet will captivate Branson audiences with brilliant presentation that will take you back to the music of rock ‘n roll and the jam session that brought together four legends in one stage. The four rock ‘n roll music icons started to know each other when in 1956, rocker Carl Perkins was in Sun Studios in Memphis for a scheduled recording session, joined by his band and fellow rock ‘n roller, Jerry Lee Lewis. The two were soon joined by Elvis Presley and Johnny Cash and the rest is history. The legendary singers sang the gospel, blues, rock ‘n roll, rockabilly, and what was fondly known that time as country western music. The Million Dollar Quartet Show in Branson will treat you an entertaining musical experience with sensational songs like “That’s All Right,” “Matchbox,” “Riders in the Sky,” “I Walk the Line,” “Hound Dog,” Peace in the Valley,” and “Who Do You Love.” This musical presentation is not simply a tribute show, it’s a loving homage to popular four brightest stars in rock ‘n roll music. In addition to these phenomenal artists, Million Dollar Quartet has features of a supporting cast of other performers that shared this musical event including Elvis’ girlfriend, Dyanne, and Carl’s brother, Jay. This Tony Award-winning Broadway musical show is the celebration of a brief moment in history when the music world pays homage to four legendary artists. The show captures the high energy spirit and rockin’ sounds of the four legends with their extraordinary talents. They came together for one of the most memorable nights to perform rock ‘n roll music in Branson. With Branson being a great entertainment destination for everything that is music, it perfectly set the stage to host Million Dollar Quartet.